Gov. 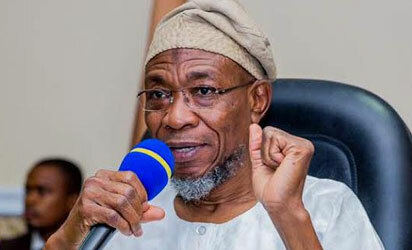 Rauf Aregbesola of Osun on Monday, urged the Nigeria Union of Journalists, (NUJ) to weed quacks and check the unprofessional conducts of some of its members. Aregbesola gave the advice while declaring open the ‘2018 Press Week of the Osun Council of the Nigeria Union of Journalists (NUJ) in Osogbo. Aregbesola, who was represented by his Senior Special Adviser on Media, Mr Yomi Obaditan, the advice became necessary because there had been a lot of unsavoury developments in the media. The governor said extortion, blackmail, and rumour mongering and falsehood promotion, by quacks among journalists, was taking prominence in the media profession. He said the practice of hear-say, innuendoes, insinuations and uninvestigated claims being published and reported under the guise of ‘allegedly’ is unprofessional. According to him, such development had brought harm to reputation, professionalism and integrity of media organisations and journalists. He said journalists and media practitioners round the globe were vibrant opinion moulders and change-agents, rousing the consciousness of people to issues of their welfare, development and security. Aregbesola said if the society would survive and overcome its challenges, the media must play a leading role, therefore, every media claim or report must be investigated and truth be published. Mr Lekan, the Cultural Ambassador of the National Museum, Ile-Ife, in his paper, said media practitioners deserved to be part of budget planning and not implementation only. Alabi, who was the guest lecturer at the event, said since several opportunities were open to journalists, they ought to make inputs into budget planning at the local, state and federal levels. The quest lecturer, whose paper is entitled, “Budget Implementation: The roles of the Media”, said media practitioners must however, learn the rudiments of accounting and auditing. He said the essential tools for journalists to make good impact or contributions to national development were qualified, creative and stable men and women behind pens, computers, microphones and the cameras. Mr Biodun Olalere, the state Chairman of NUJ, in his remarks, also stressed the need for journalists to be involved in budget planning and implementation. The post Aregbesola urges NUJ to weed quacks appeared first on Vanguard News.